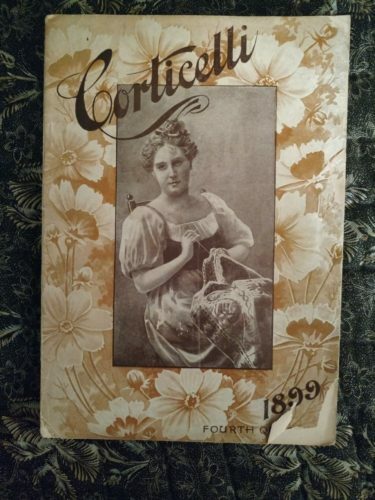 1899 Fourth Quarter (October) of the Corticelli home needlework magazine book. There are 375 pages. Seven full colored plates. Many in black and white. Several lessons on shading of flowers and leaves, such as the Daisy, Holly berry and Chrysanthemum. Included are a few pages of Battenburg lace doilies patterns. If fashion is of interested there are a number of pages previewing women clothing for the fall of 1899. Walking suits, skirts and blouses. Find out more about this antique vintage needlework magazine HERE! If you prefer to shop in our Etsy store, find out more HERE!